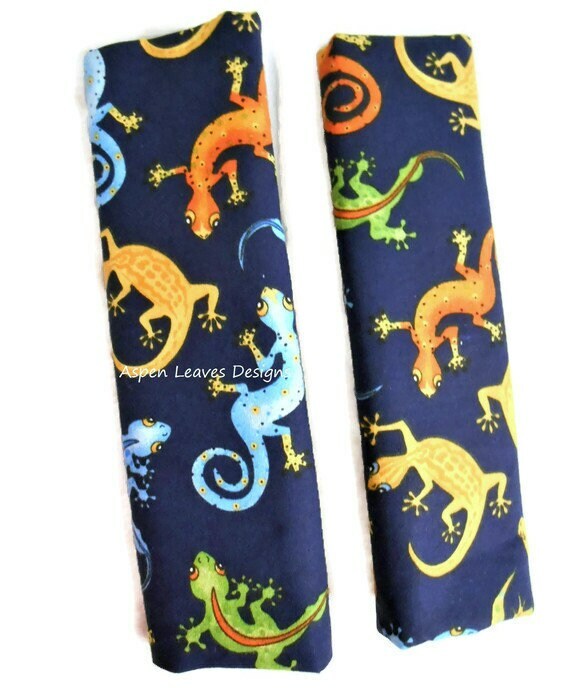 Lizards seat belt covers. Car accessory. 8 1/2 inch. Colorful lizard reptile car decor. Seat belt covers are made to order. Please allow 1 to 3 days to ship. * Pattern placement will not always be the same. It depends on where the pattern is on the fabric and how it's cut. * Two pieces of cotton fabric, lined with fusible polar fleece for added thickness. Hook and loop tape keeps your seat belt cover in place with enough room to slide to where you need it while driving. *Finished measurements are approximately 8 1/2 inches long. Care instructions - Machine wash and dry. Handmade in a non-smoking home cat friendly home. Snoopy seat belt covers. Car accessory. 8 1/2 inch. Snoopy and Woodstock at the movies. Hot air balloon seat belt covers. Car accessory. 8 1/2 inch. Colorful flying balloons. flip flops Seat Belt Covers. Summer car accessory. 8 1/2 inch. Colorful flip flops on blue. Lollipop Seat Belt Covers. Sweet treat car accessory. 8 1/2 inch. Fun car decor. Mushroom seat belt covers. Colorful toadstools on light green car accessory. Car fun-gus. 8 1/2 inch. Dinosaur seat belt covers. Colorful fun Dino's on beige fabric. Stegosaurus, T-Rex, pterodactyl car accessory. 8 1/2 inch. Chickens seat belt covers. Pretty, colorful neck accessory. Trendy birds for her car. 8 1/2 inch. Seat belt covers. Skulls and roses. Padded, soft seat belt accessory. 8 1/2 inch. Tie Dye Seat Belt Covers. Rainbow. Hippie, retro car accessory. Sunburst tie dye. 8 1/2 inch. Dragon seat belt covers. Colorful fun flying dragons on gray fabric. Fire breathers for car. Draco. serpents. 8 1/2 inch. Seat belt covers. Frosted doughnuts. Padded, soft seat belt accessory. 8 1/2 inch. Psychedelic seat belt covers. Bright colorful floral. Padded, soft seat belt accessory. 8 1/2 inch. Seat belt covers. Red poppies on black. Padded, soft seat belt accessory. 8 1/2 inch. Seat belt covers. Red poppies on white. Padded, soft seat belt accessory. 8 1/2 inch. Pineapple seat belt covers. Pink and green pineapples. Padded, soft seat belt accessory. 8 1/2 inch.